I've been wanting to have my own satchel since I first stumbled upon one in Facebook a few months ago. 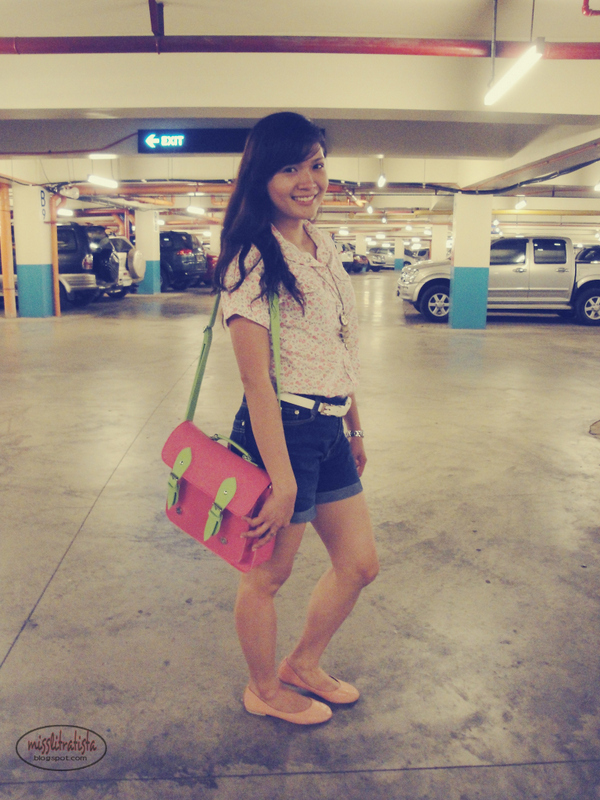 It was a Cambridge satchel - made up of very fine leather and comes with a very expensive price tag. Knowing its price, I brush off the idea of wanting one, not until I saw Philippine made satchels which are selling like pancakes online. The picky me had been choosy in selecting which colors I want that I even ended up not buying the yellow and apple combination which I saw in a bazaar here in our city. Thank God for online shops, I stumbled upon one store in Facebook which sells satchels with handles. It might not have been the genuine leather one but the better thing was, it was in an apple green and pink combination and it's even on sale! Lucky me! 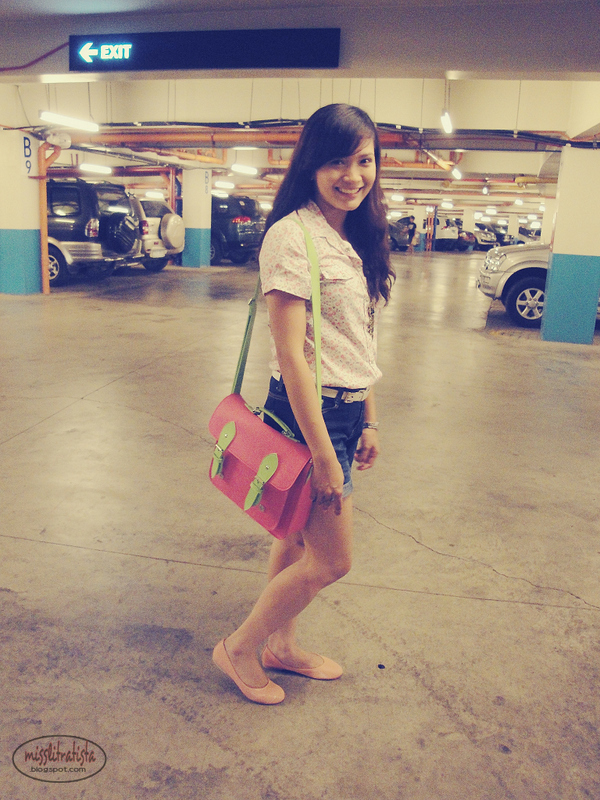 I didn't hesitate of ordering it immediately and after days of waiting, this pretty satchel finally landed in my arms! I was able to use it for the first time last Saturday when I went out on a date with the BF. Pardon my look, I have been so lazy to dress up because I have not yet totally recovered from my flu. I don't have to worry with being sick when I'm with the BF because my private doctor is always at my side. 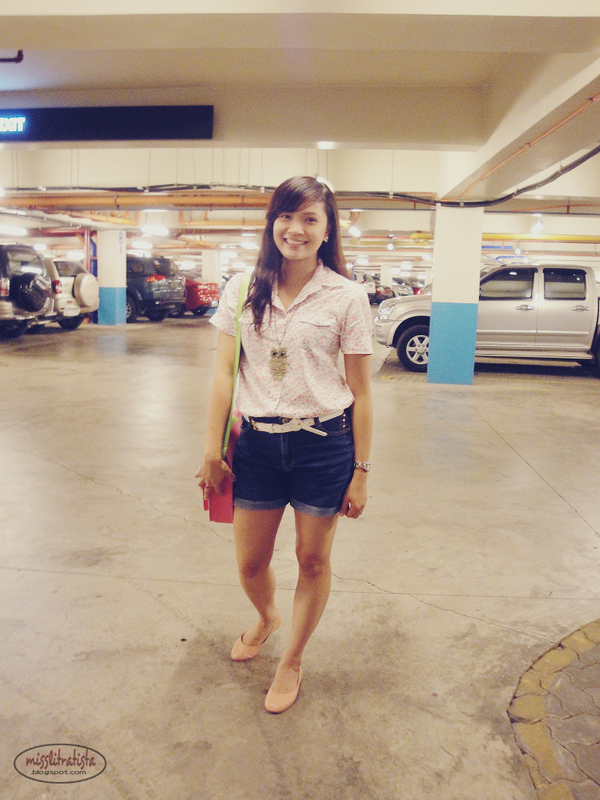 I just donned on a pink floral top, denim shorts and paired it with my salmon pink flats. I love how my new satchel accentuated my entire look! I really need to buy myself one! Love your look! I'm fond of satchels too. I love how they can make a look classy! wow this bag looks amazing! Love the satchel. And I absolutely love the colors! You're so pretty, Chamee. Found you over on Sharon's blog. Hope you can come visit me sometime. I'd like that. that is one cute satchel! thanks toni! would you like to follow each other? send me your link! This is why I miss Pinas so much, the shopping! Gaaah! I wish I bought one before I left. Love that its such cute colors! Hehe. I came from the blog hop at Then there Was Us, it's so great meeting new bloggers! I found you via the Blog Party on I Am Pisces, and you now have a new follower! (me ;D)this bag is stunning, good find!! I found you in the followers to friends blog hop and I'm now following you! I'd love it if you had a look at my blog too! sometimes, it pays to be impulsive to give new things a try! and I'm currently loving it!